Nairobi National Park, being 117.21km2, is among Nairobi’s over 70 green spaces. Green space is land partly or completely covered by trees, grass, scrub and other natural vegetation. These spaces in the city act as ‘lungs’ to the city, offer aesthetic values and provide space for research and conservation of species. Nairobi National Park is the oldest park in East Africa having being established in 1946. Currently, the park, being the only National Park within a city in the world, is undergoing a major hurdle as ‘development’ strikes the nation. As sky scrapers are being built around it and a road has already taking 53 acres of the park, a railway is set to pass right in the middle of the park dividing it into two. It’s going to be above ground on pillars, but all in all, the park will still be ‘harmed’ during construction. The park is slowly suffocating to the needs and demands of an ever-increasing urban population not forgetting to mention corruption, impunity and a whole lot of greed. By and large, people who care about the park and have already foreseen what will be the outcome of the Standard Gauge Railways (SGR) to the park, the city and the country as whole and have raised their voice to stop any possible construction of the railway. Campaigns such as SaveNNP, DontYouDareDestroyourPark and many more voices are speaking and acting to save Nairobi National Park. In my opinion, if Kenya Railways Corporation (KRC) say the railway will allegedly be erected above ground in the park, it can as well be erected above ground outside the park on an alternative route. The park should not be a part of the alternative routes in the first place. Once development ‘creeps’ into the park we may not have a park any more. Cutting through Nairobi National Park is not sustainable. 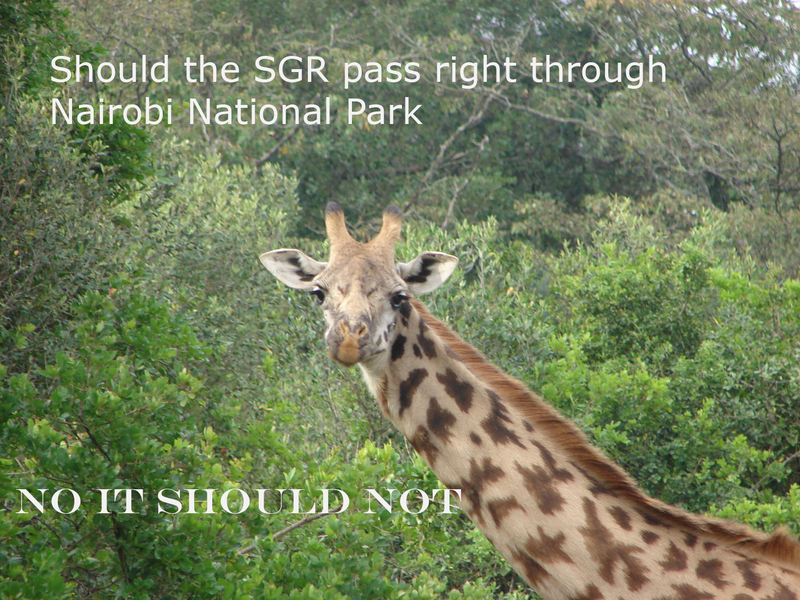 Communities living near and around the park will face the biggest negative impact if the SGR is to be constructed within the park. Wild life will not be left out as habitats will be destroyed and niches altered. 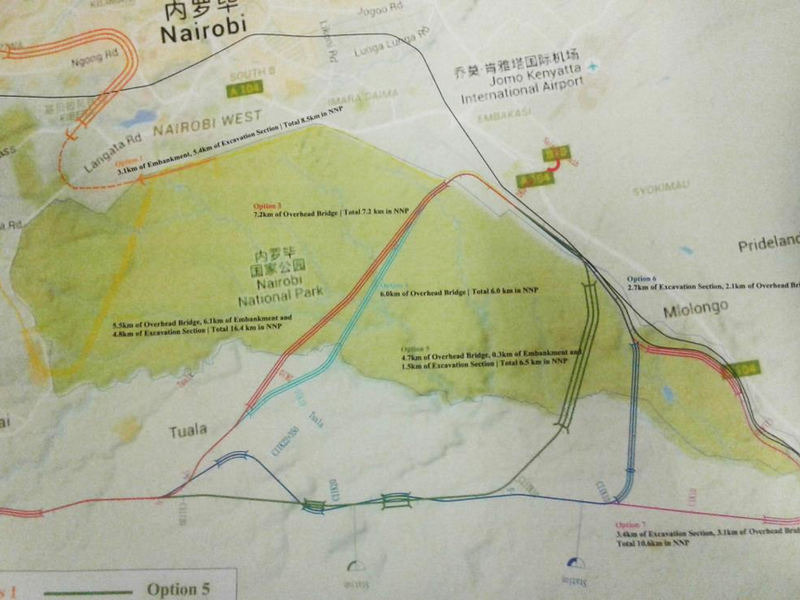 Nairobi National Park Map – The light blue line is the route suggested by KRC. Having grown up in Nairobi, I would say Nairobi National Park is one of Kenya’s park I have had the opportunity to visit countless of times with family and friends as it encompasses striking sceneries and wildlife. It constantly feels different the moment you get into the park as you leave all the hustle and bustle of the city. You get to see four of the big five and other wildlife roaming freely just few miles away from a large human population and continue to be awed at how the animals and the people have been able to coexist all this while for centuries. Bringing man-made structures into the park will destroy the natural beauty of the park as well as destroy the strong relationship of wildlife and people without any permanent interference of persons within the park boundaries. Our ecosystem needs Nairobi National Park and we (human beings) need the ecosystem. The Cycle of Conservation, Destroy be Destroyed, Maintain be Maintained. When we begin to see the animal kingdom as our kindred spirit to which we belong, we may then begin to love and respect it.